Just outside the limelight, the next generation of researchers is preparing for their shot at making science fiction into fact. When a Mayo team of researchers helped a paralyzed man stand and take steps, the lead researchers deservedly made headlines. But just outside the spotlight were some of the most important researchers in medicine: Graduate students. While preparing the next generation is the meat-and-potatoes of graduate school, getting to be part of a team that turns science fiction into reality is gravy. 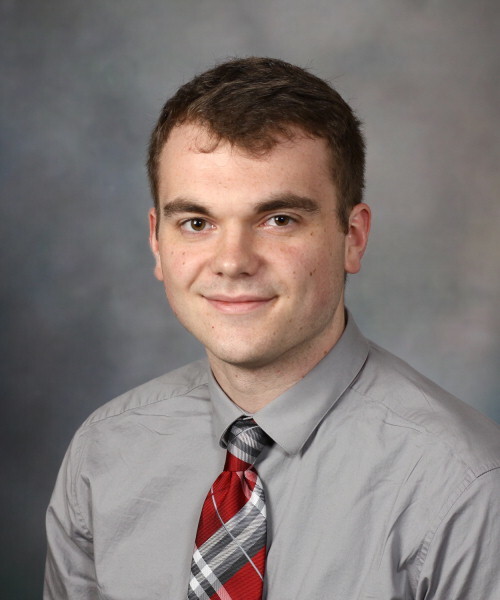 Jonathan Calvert is working toward a Ph.D. at Mayo Clinic Graduate School of Biomedical Sciences on a team pioneering the use of electrical stimulation to offer patients new hope. Whether boosting neural signals or dampening dysfunctional ones, these advances will be the future for patient care, just as Calvert will be the future of biomedical research. “It’s absolutely amazing to see such incredible progress – something no one thought was possible five years ago,” says Calvert. Calvert spent his first eight weeks of graduate school with Kendall Lee, M.D., Ph.D., neurosurgeon and director of Mayo Clinic’s Neural Engineering Laboratories, which focuses on developing deep-brain-stimulation technology. Deep brain stimulation is a form of neuromodulation, which alters nerve activity at targeted sites to manage the symptoms of abnormal nerve function. Calvert observed while Dr. Lee implanted a thin wire from a stimulator into a precise location within the brain of a man with Parkinson’s. When the device was turned on, the man’s tremors stopped. The U.S. Food and Drug Administration has approved neuromodulation with electrical stimulation to treat Parkinson’s disease, essential tremor, dystonia and obsessive-compulsive disorder. The Neural Engineering Lab also is investigating its use to treat chronic pain, movement disorders and psychiatric disorders. Fresh from a bachelor’s degree in bioengineering from the University of Pittsburgh, Calvert entered Mayo’s doctoral program in biomedical engineering and physiology, which featured a new first-year curriculum that integrates engineering concepts, the structure and function of biological systems, and an introduction to basic, clinical and translational research techniques. Calvert entered the lab with no formal education in neuroscience or neuromodulation. After other rotations and classes, Calvert chose Dr. Lee as his mentor and rejoined the Neural Engineering Lab shortly after Dr. Lee and Kristin Zhao, Ph.D., director of Mayo Clinic’s Assistive and Restorative Technology Laboratory, began collaborating on the spinal cord neuromodulation project. Calvert worked with Peter Grahn, Ph.D., who had completed his doctorate in neurobiology of disease from Mayo’s grad school just in time to join the project as a senior engineer. The team’s challenge was to help a man named Jered Chinnock walk. After a snowmobile accident in 2013, Chinnock could not move or feel anything below the middle of his torso. 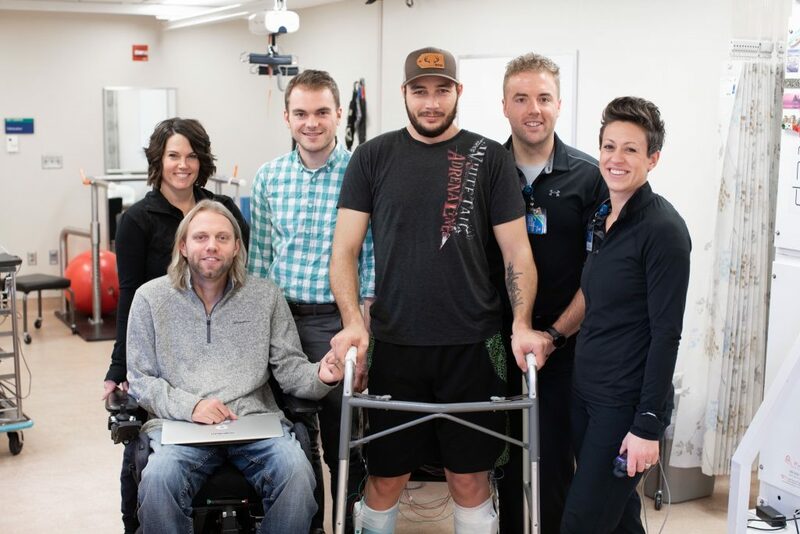 For the research project, Chinnock started with 22 weeks of physical therapy attempting to regain standing and walking without use of the epidural electrical stimulator, demonstrating therapy alone will not recover function for individuals with severely injured spinal cords, such as Jered Chinnock’s. Dr. Lee then implanted a 16-contact electrode array in the outermost part of the spinal canal, called the epidural space, below Chinnock’s spinal-cord injury and a connected pulse-generator device under the skin of his abdomen. An external controller wirelessly directed the electrode to stimulate Chinnock’s spinal cord, enabling neurons to receive the signal from his brain that he wanted to stand or step. After a three-week recovery, Chinnock resumed 12 months of ongoing physical therapy, adjusting stimulation settings as he progressed with mobility requiring less assistance and demonstrating learning of each task. Dr. Grahn worked with the team to refine the stimulation parameters, the location of the electrodes, along with the voltage, frequency and duration of electrical pulses. Calvert led the effort to analyze vast amounts of data. 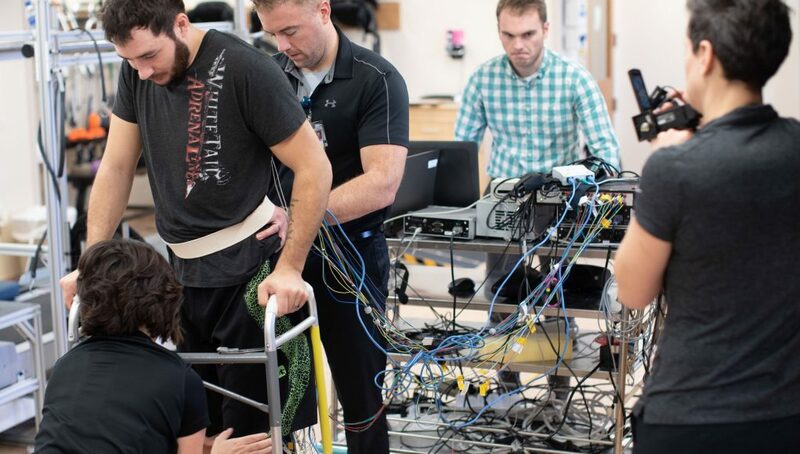 As the patient stepped on a treadmill, six sensors on each leg recorded the electrical signals sent from the central nervous system to the leg muscles. Additional sensors measured the force applied through the subject’s feet versus hands on rails, as well as changes in the joint angle of each hip, knee and ankle throughout every stride. To optimize settings for the subject, they repeatedly made minuscule changes, such as shifting the location of active electrodes by a few millimeters, adjusting voltage intensity, and modifying the pulse frequency. “Adjusting the intensity by one-tenth of a volt would result in remarkable changes in motor performance,” Dr. Grahn says. Jonathan Calvert at work in the lab. The team, in Nature Medicine, reported that electrical stimulation of Chinnock’s spinal cord and a year of intensive physical therapy produced “a synergistic functional reorganization of [brain]–spinal connectivity” that enabled him to step 111 yards using a front-wheeled walker and minimal support from physical therapists. As of January 2019, every subject reported in the scientific literature who has received spinal neuromodulation has recovered some level of motor, sensory or autonomic function, the team says. Calvert considers it a privilege to be part of “changing someone’s life” by helping patients move their legs for the first time in years, a profound moment accompanied by laughter and tears. Connections between the brain and motor neurons below a spinal cord injury can be revived after lying dormant for years. Participants regained some control of paralyzed muscles, suggesting that the nervous system and muscles can relearn. Participants learned to alternately flex some muscles and relax other muscles, improving at the coordinated control and timing of a normal gait. Next, the team hopes to find answers to a growing list of unknowns. For starters, how were the participants able to perform stepping? 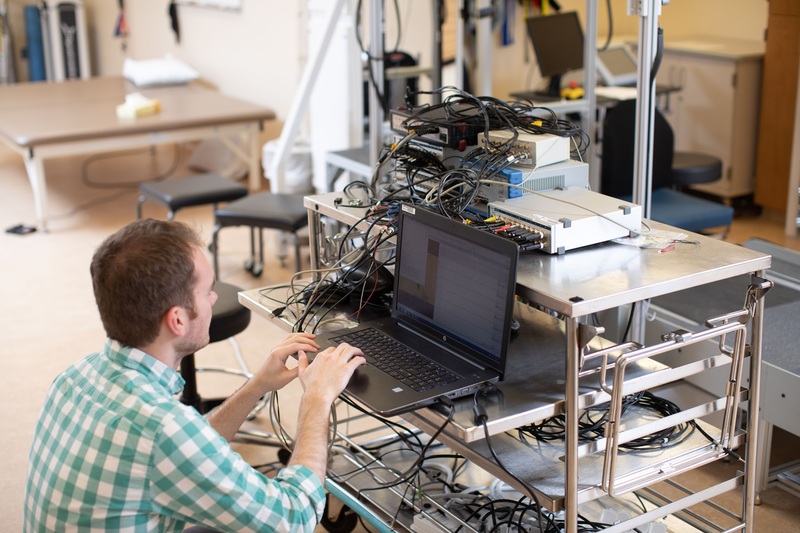 The team theorizes that neuromodulation essentially cranks up the volume of faint signals crossing the injury through remaining nerve tissue to tell leg muscles to move. What exactly happens? “We’re all learning together ways to understand how it’s working and techniques to study what’s going on physiologically,” Calvert says. Dr. Grahn sees ample possibilities for further research on neuromodulation. “There is widespread interest in understanding how we can modulate functions of the spinal cord and brain using emerging technologies,” he says, suggesting that neuromodulation could be used to modify organ function as treatment for numerous conditions. Convinced of the broad potential, the team has begun building collaborations with additional Mayo specialists to develop research projects that seek to understand systemic changes linked to using spinal neuromodulation in a larger number of participants. And expansion of research will allow more students to participate. Interest among students is growing, Calvert says. They have heard about the research team that made a breakthrough discovery, and they picture themselves in his shoes, disproving the impossible and manufacturing hope where there was none. “Every day we’re doing what amounts to science fiction,” Calvert says. Previous articleCan Computers Be Another Set of Eyes in Cancer Screening?